A/V buyers on a budget are in luck! The affordable SS-MB350H speakers will surprise you with their big, full, lively sound. We were genuinely impressed. The three-way 'MB350Hs consist of a solidly built, sealed enclosure and three different drivers: a 1" Nano-FineÂ® tweeter, a 3-1/4" HOP driver, and an 8"" HOP driver. Nano-Fine technology gives you a frequency repsonse all the way out to 50,000 Hz great for rendering the ultra-high-frequency detail of higher resolution audio formats like SACD. Sony's HOP (Highly Oriented Polyolefine) driver material is Kevlar Fiber Reinforced, very light, and many times stronger than regular polypropylene. These responsive drivers provide solid, accurate lows and mids. As a team, these drivers deliver a very enjoyable listening experience! Couldn't resist these at a pawn shop new in the box for $60. It's all about matching them up with the right receiver. They sounded surprisingly good with the various ones I have but when I hooked them up with my 1974 Kenwood my mind was slightly blown. To see if I was imagining things I A/B'd them with my Klipsch kg2s, rm15s, Tannoy m2s, and yes even my kef q300s. Long story short they are now in my den not my garage where I had initially intended them for. Right reciever makes all the difference. I try very hard not to be a "speaker snob" and these are a perfect pair to shock your friends with. I bought these as a replacement for my 6.5" RCA speakers . i did not like them at first. but i knew the woofer had more potencial. so i made some modifications: i replace all the internal wiring for 12 AWG cable, welded every connection inside, made a port in the back of the enclosure, put sound deadening material inside. disconnected the midrange.because it was so strident at louder levels. i used both resistances (crossovers) for the tweeter, and that was all they needed. now the bass is deeper and more powerful the highs are clear even at louder levels. they sound great with almost any kind of music. what i recommend when you buy this price- range speakers is that you try to get the most out of them, you will be surprised of what a little tweaking can do for your speakers. and if, at the end you don't like them you can always replace them and not loose much money in the process. JBL speakers , RCA speakers, PIONEER speakers, etc. Overall poor sound quality, no soundstage, no range. Poor sound quality, almost no low end and the highs are shrill. You would be better off getting some used speakers or buying thrift store speakers and replacing the drivers for about the same money. good highs and midbass attack; shielded so your TV won't get damaged if their mounted close by and kinda looks entimadating when used in a surround sound system. as good as the bass is still needs 1 or more subwoofers to handle bottom end(around 40-60hz and below); the box(enclosure) could be better built and more entertaining to look at and yes their are vary big for "bookshelf" type speakers. These Sony SS-MB350H "bookshelf" speakers are one of the best sounding speakers I've ever heard (in their price range).Their so good and so affordable that I replaced my Yamaha speakers with 4 pair of them and haven't looked back sense.I've got them set up in a 7.1 surround sound system with two for the front and rear center channels; two for the front left and right sides; two on the sides walls and three in the back for rear fill. once I put them in place( the center and side speakers is bolted to custom made brackets firing up at a agile) and hooked up;I set the crossover in my receaver at 60hz(using 12 occtive slope filters) and let them play and boy did they ever.even without the my Accoustic Research S115PS 15" subs backing them up they played loud and low with good highs and midbass attack.Now I'm not saying their better then some of those $5,000.00 plus dollar systems out there but for just under $3,000.00 total( receaver and speakers) I've got a system that I bet can take them on no problem. 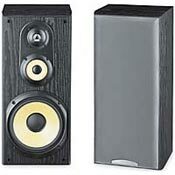 If your not looking for audiophile type sound try these speakers in your system.They sould do great. Very accurate sound for a bookshelf that at least offers some bass capability. Accurate at both high and low volume settings. Somewhat large for a satelite. On the other hand not as much bass or efficiency as a floor standing model. These speakers come highly recommended and are indeed great all around bookshelf speakers for the money. I am using them as rear satellites (for which they are probably overkill). they are very good bookshelf speakers, but I would reccomend using one of the floorstanding Sonys as your main speaker (particularly the SS MF650 if you have a home theater setup). In a dorm room, or conbined with a sub, these would be more than sufficient. Also, if you are thinking THX, this is about the best price for a full-range side or back speaker that you are going to find. Perfect out of the box, so no need for contact. Listened to everything, but the speakers these replaced were extra-crappy KLH units. You only get so much for $100.00 bucks. These speakers are good quality for the money( $55.00-each) It does take some power to drive them (acoustic -susp.) but at some volume provide adequate bass and fair separation. OK by themselves, much better with a sub. Use them for the front or rear in a HT system, just don't expect toooo much. Overall I am pleased, considering the price. Lower-end JBL's, Cerwin Vega's and other's. Nice Finish despite the faux wood veneer look. Fairly substantial weight. Kevlar cones and just plain good looks. Not much to gripe about considering the price I paid for them. After carefully researching this set of unusually large bookshelf speakers, I went ahead and bought them. Can't beat the price and looks of the speaker. I think the yellow colored kevlar woofer cone is neat looking. I was very pleased with the sound that came out of it. I have my Sony STR-DE945 powering them and I am currently using them as mains and switched the Cerwin Vega L7 to the rears and have a Cerwin center channel ( E-76 ) that sounds really good as well and finally tying down the system with a nice small Yamaha YST-W215 subwoofer and I'm good to go. The Sonys do sound great when listening to classical or jazz music. I especially hear the highs more this time around compared to the Cerwins I was using. I hope they last a good while considering Sony isn't really known for their speakers. Overall a very good value especially if your on a budget. At best Buy, you get what you can. Boston Acoustics HD5 and Cerwin Vega L7 bookshelf speakers. I can honestly say that these speakers are some of the best this size I've ever heard. I had to take a Humanities class that was taught by an audiophile. He had his whole classroom set up with big, old speakers aranged in a surround setup. These make me feel like I'm sitting in the middle of his classroom. Obviously, they don't have as much bass as his system did, but they're pretty good for a hundred bucks. Weak bass, Weak Mids, to much treble. I needed a cheap pair of speakers for exercise room so I bought these because they were on sale and were substantial. Despite what I hear about these speakers, I find the sound disapointing. The bass is OK but not on par with speakers of this size and with 8 inch drivers. I thought the midrange, especially in the midbass area extremly thin and weak especially that I like to listen to some metal. I thought the high frequencies were over pronounced and some some times made a screaching sound. Nevertheless there was no coloration in the sound or resonance due to poor construction. I think sony built these speakers for people who do not understand good audio and just want speakers with bass and treble with no mids. In my opinion my old mini system sounded better. They also are not ugly to look at at and seem to be well built for the price. These speakers are decent for fifty dollars and work just fine for casual listening, but are in no way very good. Excellent balanced sound quality. Great low price. Quality drivers deliver good sound across a large frequency level 50-50K HZ. Sturdy well made speakers. Not as efficient as some of the more efficient expensive speakers (takes more power from amp to play speaker at the same volume level as more efficient speaker. Larger cabinent than most surrounds, I use them as my main front channels so this is not an issue for me. These speakers are EXCELLENT especially for the price. I am using them for my front mains with a subwoofer, center channel and 3 surrounds. Very smooth balanced sounds handles everything except deep bass very well (not an issue if you have a subwoofer. I have played these speakers on challenging movies with tremendous action sequences, jazz, classical & popular music. They do not disappoint. The sound rivals speakers 3 times more expensive. Sony has not been known in the past for their speakers but they have definitely stepped up their game and kept costs in check without compromising quality. I have owned much higher level speakers in the past and spent alot more money than this. I have owned B&W's, Polk's, Bose & Yamaha in the past these are as good as the best of them for a fraction of the cost. Stop reading this now and go buy a set. Make sure that you have a strong clean amplifier to power them as they are not as efficient as some of the more expensive speakers. This is not an issue if you have an amplifier at least 90- 100 watts a channel, clean. I give them a 5 on value and a 4 on the quality of the speaker, only because you can spend lots more money and eventually obtain a better speaker. If you are considerate of value and don't want to spend 350 - 500.00 for speakers that sound like these for $100.00 this is your speaker. If money is no option go drop 700.00 & up for a better sounding speaker. That's the price range you will be in before a noticable difference! KLH surrounds, B&W front mains, polk front mains, yamaha front mains.